To say that Brown Coach is well diversified is an understatement. From the types of vehicles in its fleet, to the various services offered, to the differing management skill sets of its owners, brothers Robert and Stephen Brown, diversification is the key to the Amersterdam, N.Y.-based charter, commuter and tour company’s success. Robert, who serves as president of Brown Coach, got his start in the school bus business prior to serving in Vietnam, and returned to eventually open his own school bus operation in 1976. In 1980, an opportunity arose to purchase a nine-motorcoach charter business, and thus was born Brown Coach. Robert was joined by his brother Stephen, who serves as the company’s vice president and graduated from nearby Union College with a degree in mechanical engineering. Together, the Browns have built Brown Coach, and its affiliate Upstate Transit of Saratoga LLC, which the brothers purchased in 2005, into a fleet of 49 vehicles, providing charter, commuter and tour services, focusing primarily on the northeastern U.S. and eastern Canadian provinces. It has also maintained its 225-vehicle school bus businesses and operates Brown Tours, which offers motorcoach tours to destinations all over the country. The company has offices in Schenectady and Saratoga Springs in addition to its headquarters in Amsterdam, N.Y. In addition to its successful businesses, both Robert and Stephen are actively involved in the industries they are part of, including in the motorcoach sector, the International Motorcoach Group (IMG), the United Motorcoach Association (UMA), the American Bus Association (ABA) and Bus Association of New York. It is for these reasons and more that Robert and Stephen were named METRO Magazine’s 2015 Motorcoach Operators of the Year. METRO’s GM James Blue presented the brothers with the award at the UMA EXPO in New Orleans in January. In January, Brown Coach received METRO’s 2015 Motorcoach Operator of the Year award at UMA Expo. From left to right: Brian Annett, chairman UMA; Stephen Brown, VP Brown Coach; Robert Brown, president Brown Coach; and METRO’s GM James Blue. Stephen explains that what he thinks sets Brown Coach apart from the competition is the diversity of vehicles the company offers. Vehicle sizes range from seven-passenger mini-vans to 55-passenger coaches and include school vans, full-size school buses and several different types of wheelchair-equipped vehicles, including 55-passenger wheelchair-equipped coaches. Brown said one trend he is currently seeing in the market is more people requesting smaller vehicles, partially because group sizes have shrunk, and partially because more customers are becoming more environmentally conscious, so the company has recently added some 35-foot Temsa coaches. Brown adds the diversity of services also enables more opportunities for its employees in a northeastern market that is mostly seasonal. 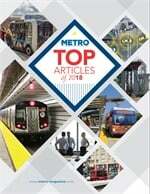 In 2008, Brown Coach was named one of METRO’s Innovative Operators. At the time, due in part to Stephen’s background as a mechanical engineer, the operation was implementing a computerized system for the controlling of engine block heater electrical outlets to improve efficiency and reduce cost. Brown adds that it is hoped these initiatives will lead to more cost-effective, efficient and environmentally-friendly methods of providing creature comfort for the company’s passengers. Several years ago, the Brown’s designed and built a 27,000-square-foot facility in Amsterdam, N.Y., that houses administrative offices and repair facilities for both the motorcoach and school bus operations. Stephen explains that he believes one of the biggest benefits to having everything under one roof, so to speak, is the value added to its customers. Aside from being active in many associations, both in the motorcoach and school bus industries, Brown explains both he and his brother Robert are active in their local Rotary Club chapters. “It is a great place to get to know the business and community leaders in your area while helping with projects in our hometowns,” he explains. They also give back via charitable work, including Honor Flights and Wounded Warriors. While running a family business can be challenging, Brown believes the key to his operation’s success is the fact that he and his brother have different skill sets and areas of expertise. With much of Brown’s growth over the years happening organically — often through purchasing operations that are either selling or exiting the market — Brown says the family has no immediate plans for expansion. With the operation growing over the years to more than 300 employees, Brown says that he and his brother not only think of the well-being of their own families, but also, the families of all of their employees when weighing important decisions that will impact the company.